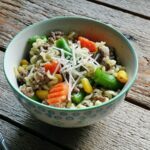 If you’re looking for a quick weeknight meal, this inexpensive Ramen noodle casserole in a skillet should be added to your menu. It appeals to kids and adults alike, and tastes a lot better than I thought it would. After all, I like Ramen noodles. They are great in a pinch, super cheap.. I mean, what are they? 10 cents per package?? But it took me a long time to give in and try them in a different way other than as a bowl of soup. If you have adult children that have recently moved out, or maybe you have a child in college, this is a great meal for them. My daughter is 20 and moved out over a year ago. She’s always looking for inexpensive ideas. She lives with roommates and attends college, so her budget is tight. Frozen vegetables are only a couple bucks and you can find ground beef on sale quite often. She’s always looking for good ground beef dinner ideas. I have two adults “kids” now, and you know how the older generation always says “they grow up faster than you think”? Well, they were right. My oldest son will be 22 in a few months and he’s driving a big rig for a living. Here’s a picture of him from my Instagram feed parking his truck to come home for the weekend. You can barely see him behind the wheel. Truly blows my mind that it seems like yesterday I was volunteering my time in his Kindergarten class! And my daughter? The one little girl that God blessed me with, is out of pigtails many years over now. She’s all grown up and just turned 20 this month. She’s pictured here with my youngest son who turned 15 a couple of months ago. Mommas… cherish those babies while you can. Because before you know it they are moving out. I am so proud of all my kids! They’re goofy and silly and they love each other. Sure, they hate each other sometimes too… but not really. When it comes down to it, they have each others’ backs. Even if they do get on each others’ nerves sometimes. Here’s a shot of my 15 year old (left) and my 16 year old (right) messing with my daughter. She’s surrounded by boys in this family! So before they grow up and move out, try this dish one night. If you want to lighten this up a little, you could substitute ground chicken or turkey, or change the flavor by using a ground sausage instead of the ground beef. I think even strips or cubes of chicken breast would be a great protein in this dish. Do you have any dishes you’ve wanted to try for a long time and have been putting it off? I have a bunch of ground beef recipes here, or if your looking for one-dish meals, try my casserole recipes section. Open all three packages of Ramen noodles. Remove seasoning packets and set aside. 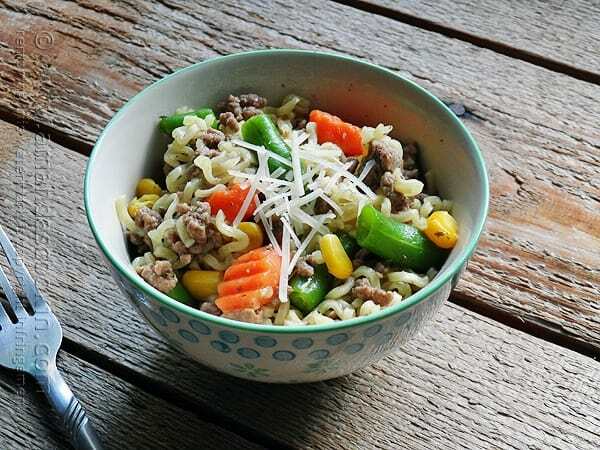 Break noodles up into 1-inch chunks. Set aside. Brown ground beef in a skillet until no longer pink, drain off fat. 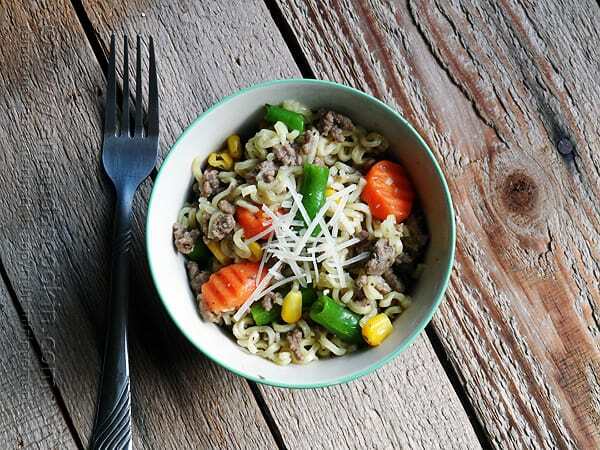 Return meat to the pan and sprinkle with the seasoning packet from the mushroom flavored ramen, saute for 2 minutes. Remove beef from pan and set aside. In same skillet, add 2 cups water and bring to a boil. Add frozen vegetables, all of the noodles, garlic powder, thyme and the two chicken seasoning packets. Bring to a boil again then reduce heat to medium low. Cover and gently boil for a few minutes or until noodles are tender, stirring occasionally. Return meat to skillet, toss together and serve. I don’t see the printable recipe on this page. Do you still have it somewhere? I am so glad you said something Peggy! I don’t know how it got deleted, but luckily I still had it and it has now been restored. Thank you! Hi Amanda. The recipe that you made here,May I know how many pax is that for cos 3 packets of ramen noodles seems alot for one to eat. And I’m so following you on instagram. Hahaha!!! Hi Fye. This recipe is enough to feed 4 people. I made your 3 ingredient French Vanilla Peach cobbler? Can I replace cherry pie filling for the peach? Hi Beverly! I don’t see why not :) However you may need to drizzle a little water or apple juice over the top of the dry ingredients since pie filling has a more jelled consistency than fruit packed in juice. Let me know how it turns out! you were asian and was shocked to see all the blondes. I enjoy all your baked goodies!!!!! !